We are less than a week away from Super Bowl LIII, one of the most watched sporting events of the year. It’s where every name in the NFL aspires to be – but, this being football, it’s important to remember that there are also a few common injuries that could leave a player on the bench, before, during, or after any game, not just the Big One. 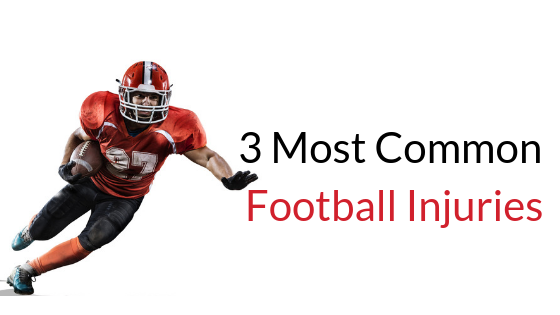 Let’s break down some of the most common football injuries and the treatments for them. Did you know that football players have a 75% chance of suffering a concussion? A concussion is a mild traumatic brain injury, which can occur when your brain becomes bruised due to a blow to the head. It can occur during man-to-man contact or as a result of falling due to a tackle. The best course of action if you have a concussion is to seek treatment immediately to help reduce any more long term effects and to help you return to your normal routine quickly and safely. A physiotherapist can determine what combination of exercises and therapies would be best for your case. An ACL tear can be one of the most devastating football injuries, but if treated immediately, it can heal and be prevented in the future. An ACL tear affects one of the ligaments that stabilize the knee. Injuries happen when making a sudden turn when running, or when the knee takes a direct blow. An exercise plan designed for you by a qualified physiotherapist can rehabilitate your knee back to normal levels of function. Every athlete is different, but the goal of ACL physiotherapy is to increase the range of motion of the knee, strengthen the muscles around the knee, and improve balance. Rotator cuff strains often occur from overuse and repetitive motions such as throwing a football or trauma from man to man contact during a tackle. This type of injury can be particularly difficult for the Quarterback, but it can be treated with physiotherapy and with the help of a physiotherapist, you can work to prevent this overuse injury. 75% of patients can recover from a rotator cuff strain. Once you have been assessed by a physiotherapist, you could be prescribed a number of different treatments including stretching and strengthening exercises, manual therapy, or deep tissue massage. Whether you’re an athlete who plays as a pastime, on a professional level, or to work your way to the NFL, we encourage you to seek both preventive and restorative treatments from a physiotherapist to help you improve recovery times and stay in the game longer. Find a physiotherapy clinic near you and book an assessment today.